We’re sneaking into the shortest day of the year here and my northern Canadian heart will be happy to see the sun start to make its way back to this hemisphere to have some longer days. Right now the sun rises at 8:48 am and sets at 4:16 pm. Makes for a short day, and a long cozy evening. 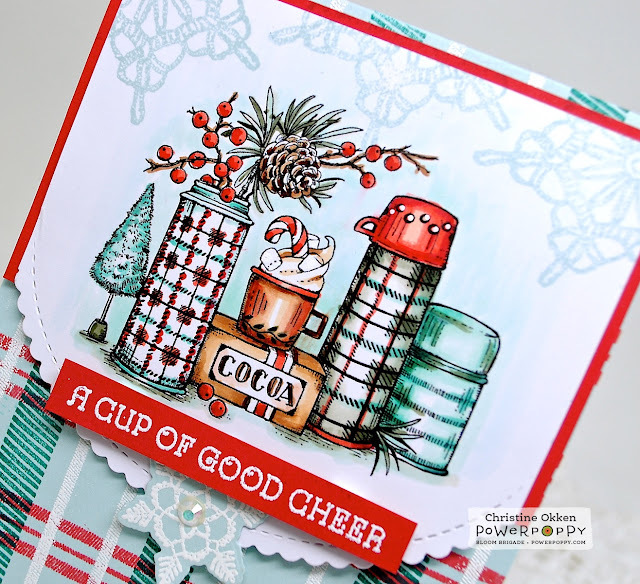 Perfect for this warm set from Power Poppy called Snuggle Down. Just look at how CUTE these vintage plaid thermoses are! After giving them some colour with Copics in one of my favourite combinations of blue/green, red and white, I used a scalloped oval die to shape the bottom of the image. One of the BEST things about this cute set is the ability to make your own plaids. There are four different strips of line images which you can use to DIY a plaid design. I went to town with some teal, red and embossed white. I love how it perfectly coordinates with the colouring on the thermoses. To accent, I stamped some pretty crocheted snowflakes from Power Poppy’s set Grandma’s Snowflakes in soft sky ink, and then added a white embossed snowflakes from the stamp set and cut out with the coordinating dies, to the bottom of the oval edge with a faceted gem embellie. A popped up embossed sentiment makes it complete, and can be used not only for Christmas, but all winter long. This will probably be my last post before Christmas, so I want to pray blessing over each of you this season. Praying you’ll know joy, deep peace, the love of precious people, time to celebrate and to reflect, time to dwell with the great assurance that you are loved by this Christ-child I celebrate, Emmanuel, God with us! This is such a lovely card, Christine. 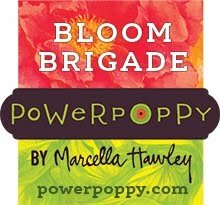 I always enjoy seeing what you've created, especially for Power Poppy. Christmas blessings to you and your loved ones. Thank you for the lovely work you have shared with us all year. I wish you double the wishes you have wished for us this season.As my grandson says each time the car starts, thank you God, Thank you God , Thank you God and Thank you Jesus! Merry Christmas! I'm better late than never. I hope you had a lovely Christmas, Christine. I adore this set and the card you made with it. Wonderful coloring and the plaid is fantastic. Great in combo with Grandma's Snowflakes, too. Looking forward to starting next year's Christmas cards with this year's Power Poppy stamps. Happy new year! 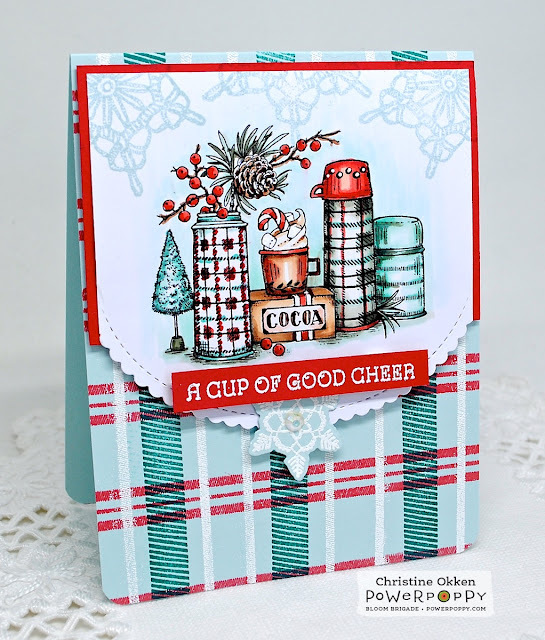 What a sweet and very merry scene in plaid, Christine!! I am so grateful for all the cheer, scripture, and beautiful sentiments you’ve shared here! I wish you a blessed new year and look forward to my visits here!